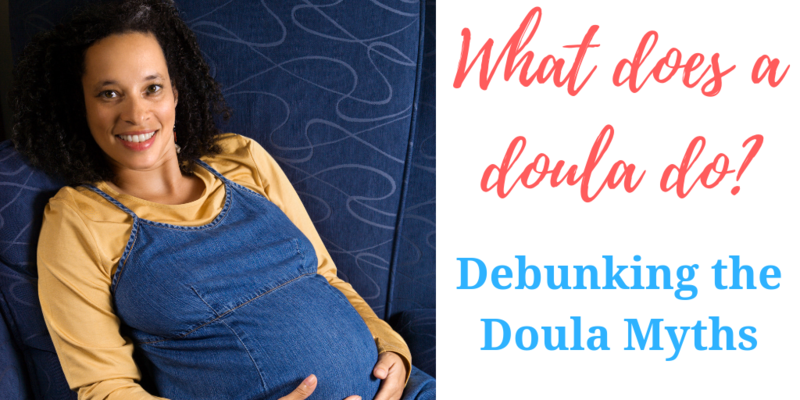 Many people still don’t know what a doula is OR what the role of a doula is truly about, so let’s explore further and debunk some myths surrounding the role of doula. No. While doula’s are trained professionals, we are not medically trained to deliver a baby or administer medical care or advice. A doula, in simple terms is a woman who is trained to assist another woman during childbirth and who may provide support to the family after the baby is born. She is non-medical person who assists a woman and family before, during and after giving birth. This can be in the form of emotional, physical and/or mental support and help. She is there for emotional support as well as physical support, but only if the mother is comfortable with physical contact. Doulas support all types of birth. Whether it be a hospital birth with an epidural, a homebirth, or a planned cesarean; doulas want to support you in your birth choices. A doula’s role is to be an un-biased support system for mom, partner and baby while maintaining the integrity of providing the client with evidence-based resources for the family. A doula can be there with encouraging words, reassurance, and provide physical and emotional comfort to all laboring mothers. This allows the mother to make her own educated decisions on what she believes would be her best birth. ALL birthing mother can benefit from a doula. Regardless of if you’ve been through labor and delivery before, doulas can bring value to your birth. A doula is there to support and care for a birthing mother. Every single birth is unique and new. Each birth brings a new story that unfolds and a doula can be there to advocate by supporting and encouraging the mother. A role of the doula is not only to be a sound support system for the mother; she is also there to be the support system for the partner and family. The partner has a vested interest in the laboring mother and is connected deeply with them. While a mother is being born by this process, so is her partner. A essential role that a doula can play is the encourage, guide and nurture not only the mother, but also her partner gently. A role of the doula is in part, to educate clients to make informed decisions without communicating directly to the medical staff. Doula’s give their clients all the materials they need to make the most informed decision for the birth story. The role of the doula is to instill confidence in the mother and family so they can best advocate for themselves during the birth process. Education is an essential tool for the doula to provide to the parents so that they can communicate succinctly and confidentially to create the best birth experience for everyone. All in all, the doula myths that people hold need to be shed so we can encourage our mothers to have a better birth experience with a doula present. A doula is there to encourage, educate, comfort, care, and support mothers and families lovingly. Zoe Lukas is a wife and a mother to 5 bouncing kiddos. She is a Birth Doula and a Child Birth Educator passionate about birth education, as well as keeping the narrative open on all topics birth related. When she is not educating and supporting families she enjoys being outdoors with her family, Midwest lake life, creating art on all levels, cooking, and playing cribbage with her husband. She resides and serves families in Minnesota.